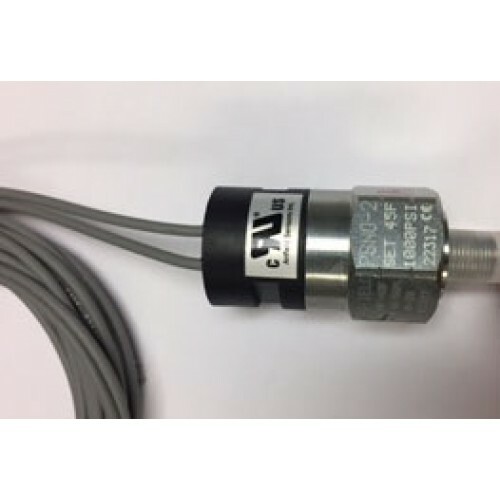 The Maxton (PSNO-2) Low Pressure Switch (Anfield: SMF-45F-2M-A-96FL-8-20-S050, cURus E327045) has been tested specifically for hydraulic elevator applications to comply with ASME 17.1/CSA B44. The switch has been pre-set for a fast and accurate response in a low-pressure activation and can be mounted directly to all Maxton UC series control valves. ASME A17.1-2010 Rule 3.26.8 - When cylinders are installed with the top of the cylinder above the top of the storage tank, a pressure switch shall be activated by the loss of positive pressure at the top of the cylinder. The swtich shall prevent automatic door opening and the operation of the lowering valve or valves. The door(s) shall be permitted to open by operation of the in-car door button, when the car is within the unlocking zone.